Helicases are a ubiquitous class of ATP-dependent nucleic acid unwinding enzymes crucial for life processes in all living organisms. There are six classes of helicases based on their conserved amino acid sequences. All eukaryotic RNA helicases belong to the SF1 and SF2 groups. Groups SF3–SF5 are mainly viral and bacterial DNA helicases, while SF6 includes the ubiquitous mini-chromosome maintenance or MCM group of helicases. SF3–SF6 are also characterized as hexameric ring-forming, whereas SF1 and SF2 groups are usually monomeric. The SF2 class is the largest group of helicases, including both DNA and RNA helicases with the widest range of function in replication, transcription, translation, repair, as well as chromatin remodeling. There is no clear sequence-based separation between DNA and RNA helicases. SF2 also includes both RNA and DNA helicases that are involved in biotic and abiotic stresses. While both DNA and RNA helicases play important roles in normal cellular function, the latter are more markedly involved in stress alleviation. This functional divergence was also evident in promoter sequence comparisons of the 113 A. thaliana helicases. Some DNA helicases like those from SF6 (MCM) and SF2 (CHR) are also active under stressed conditions. However, the most prominent stress-activated helicases are those with the conserved amino acid motifs, DEAD/H. 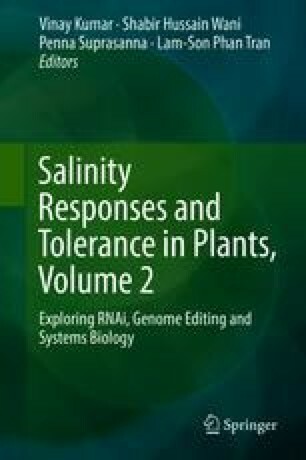 Overexpression of DEAD/H helicases in many crops confers a growth advantage in the transgenic plants and has resulted in their protection against major abiotic stresses, such as salinity, drought, and oxidative stresses with minimal loss in yield potential.